This one step process of seeding creates a layer of mulch which acts as a soil stabilizer to prevent water and wind erosion, also allowing for easier seeding where heavy, bulky equipment may not be able to seed. 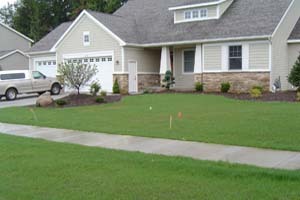 The mulches unique ability to retain moisture allows the new seedlings to germinate quicker than traditional seeding methods creating a beautiful lush lawn in a fraction of the time. 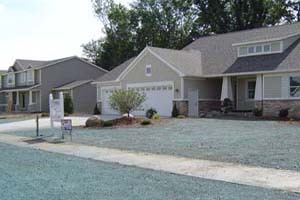 It is also a cost effective alternative to sod. It’s important when hydroseeding to take into consideration the seed blend being used this may vary depending on the application, soil type or the amount of sunlight and shade in the hydroseeded area. Some seed varieties thrive better under certain conditions and soil types. Fraaza Enterprises Inc. will evaluate each site and chose the correct seed blend for your specific needs or site conditions where some companies may only seed with one blend. Fraaza Enterprises Inc. uses only the best materials available to us in the industry, our mulch is 100% wood that is thermally refined to allow for superior water holding capacity. Our seed varieties are specifically blended for Michigan’s’ climate and are poa free and blue tag certified. 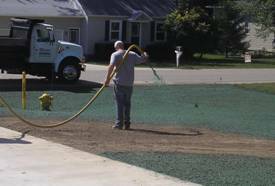 Hydroseeding cost can vary depending on the size of the project, accessibility and the type of seed or mulch material being used. Fraaza Enterprises Inc.uses 100% wood mulch for its superior water holding capacity and density, but when cost is an issue we have a solution by offering you the option of choosing a less expensive paper cellulose mulch allowing you to keep your project on budget. Hydroseeding has a wide variety of uses, here is a list of some of the areas we have expertiece in. 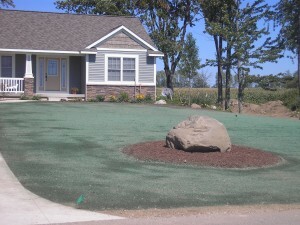 We offer a variety of lawn and MDOT Blends for the following applications serving Home Owners, Contractors, Landscapers, Developers, Excavators, Builders Etc.